We are back to dodging the desert wind here on the lower Colorado River, but we did manage to get a couple good days of kayak fishing in before the 20-30 mph wind started howling. The fishing conditions were pretty decent although the temperature was over 100°, pretty hot for sitting in a plastic tub baking like a loaf of bread. We caught a good number of largemouth bass and farmed a bunch more. Overall, there was plenty of kayak fishing action. 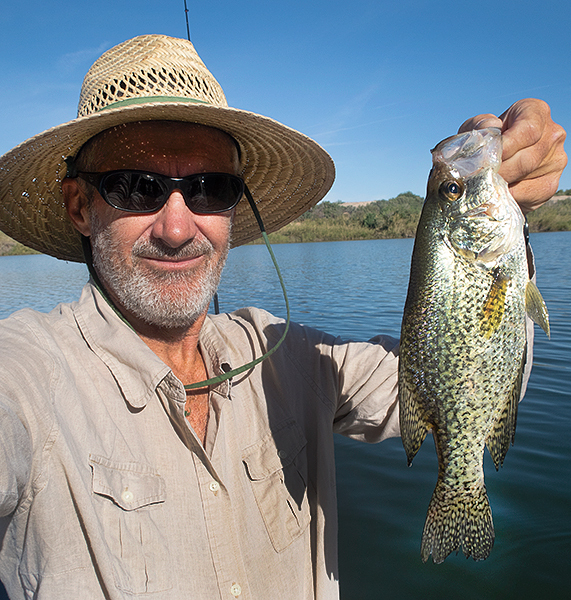 I even caught this pretty good size crappie. I caught four or five crappie that were about this size to keep the action going between largemouth bass. Aside from a couple unusual springtime 100° days, the weather is really nice this time of year in the desert southwest. If the wind is calm, there can be some outstanding kayak fishing conditions with a lot of largemouth bass fishing action. 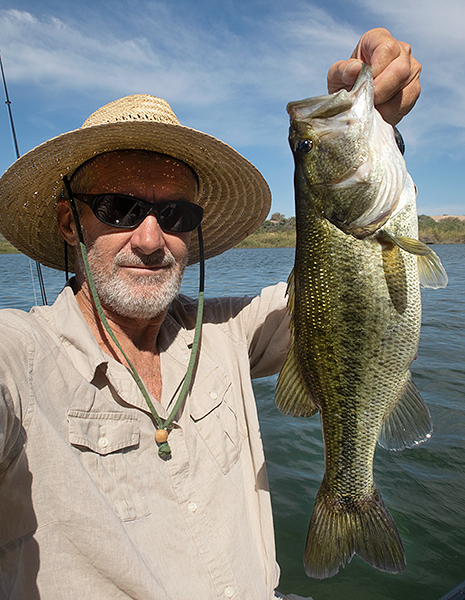 Happy to report that the big Colorado River largemouth bass are still active and ready to bite. Most of the bass were “one pounders” with a few nicer fish and this bigger largemouth bass. Our kayaks at watermanatwork.com spend a lot of time on the water and on the roof racks of the truck bumping across some rough terrain on the way to the water. 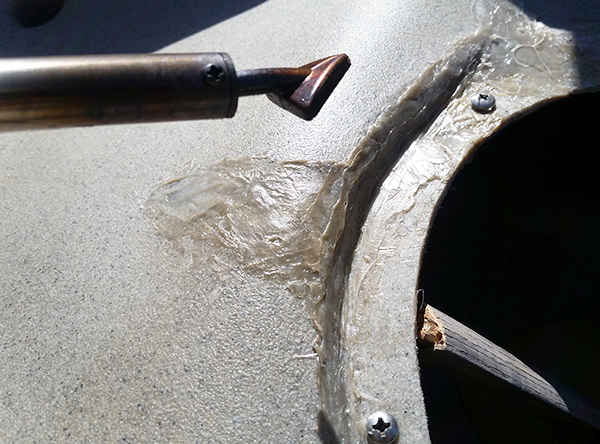 The faithful Hobie Quest developed a crack around the center hatch a couple years ago and despite a couple repair plastic welding jobs, the crack continued to get larger until a chunk of plastic between the seat and the hatch broke off. On a windy day in the desert, I attempted another repair of this minor turned major crack. Using a Harbor Freight plastic welder and solar power, I did a major welding repair job. I did the best welding job I could and used JB Weld to fill a gap between the hatch and the repaired deck hatch flange to seal a small gap and hopefully, add a little strength. The crack formed because the kayak deck in front of the seat and behind the hatch is unsupported. The weight of the paddler and stress from getting in and out of the kayak eventually cracked the plastic. The Hobie Quest isn’t defective, it’s over ten years old and starting to show it’s age. To help prevent the deck crack from returning, I stuck a basketball under the seat/hatch area to support the weight of the paddler and take the stress off the repaired deck. 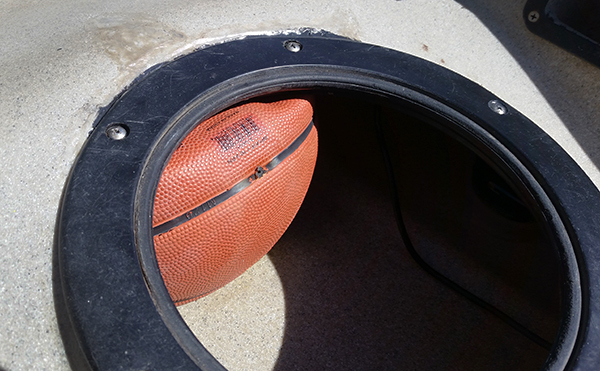 I left the basketball air valve accessible so I can adjust the amount of air in the ball. It’s supported the broken deck for awhile now, I hope it will continue to do the job and prevent the crack from reappearing. The kayak is all fixed up and we are ready to get back on the water. We will be watching the wind very carefully because our winter largemouth bass kayak fishing trip is nearly over and we don’t want to miss a single day. Check back soon!